One of the two principal guest suites is named after John Adams, second President of the United States. It overlooks the gardens. Earlier this week President and Mrs Obama arrived for London's G 20 Summit. 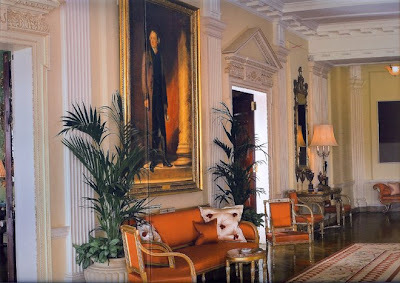 They stayed at Winfield House in Regents Park, the official residence of the US Ambassador. 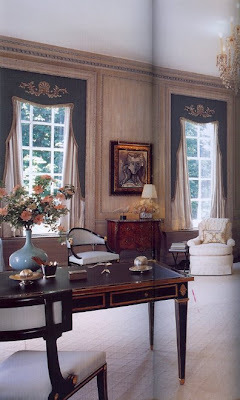 These images are taken from the handsome book Winfield House conceived by Maria Tuttle (wife of the then Ambassador Robert Tuttle) who contributed to the text with Marcus Binney. The reception hall has regency furniture upholstered in the most unusual terracotta silk and the white cushions are padded with matching tassels. That's a portrait of Thomas Jefferson. On the end walls two Mark Rothkos sit comfortably and subtly in this traditional context. 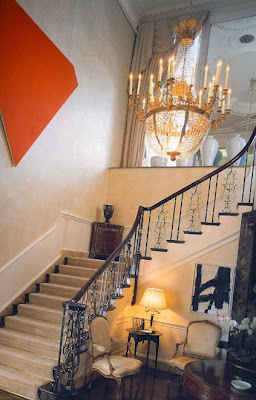 The main wrought-iron staircase was introduced by Ambassador and Mrs. Annenberg in 1969. The Empire chandelier was a gift from them. The walls bear Ellsworth Kelly's Red-Orange (1980) and Franz Kline's Black and White (1957) loaned by MOCA in Los Angeles. 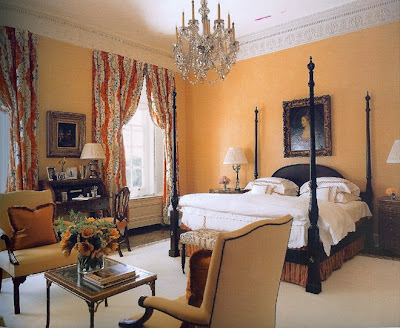 In the Yellow Room a tulipwood marquetry commode in French transitional style. 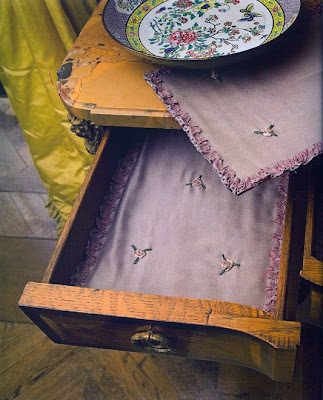 The satin drawer liners with silk rosettes and ribbon trim are believed to have been made for Barbara Hutton. 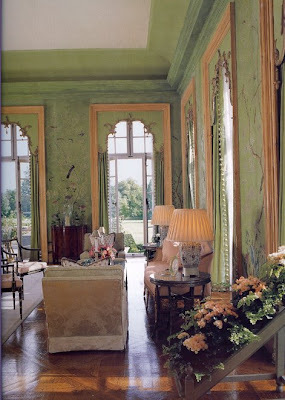 The Green Room as redecorated by William Haines for Ambassador and Mrs Annenberg. 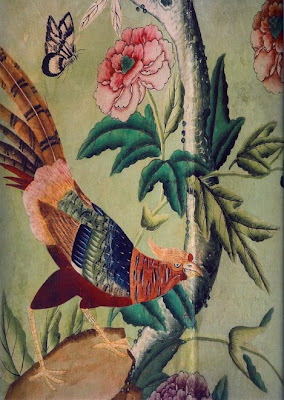 It is hung with a late 18th C hand-painted Chinese wallpaper formerly at Townley Hall in Ireland. 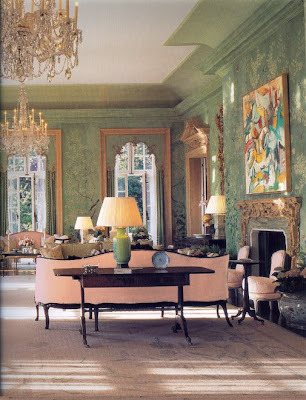 Above the fireplace hangs a Willem de Kooning - a bold placement which I think looks stunning. 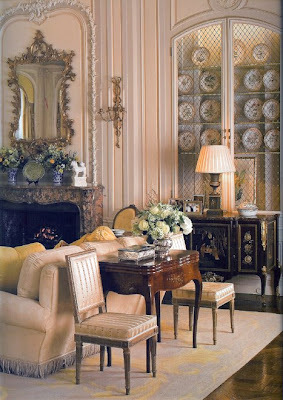 The eight waxed pine pelmet boards were designed by William Haines. This room opens onto the garden on two sides. The images here don't do justice to the book which has a massive four-page view of this room. A portrait of Barbara Hutton by Russian painter Savely Sorine (1940). 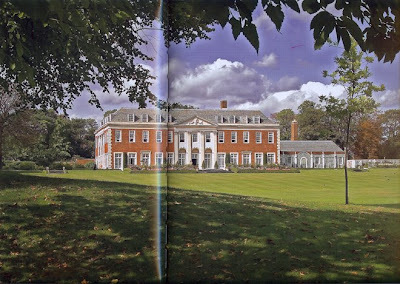 Winfield House was built for the glamorous heiress in 1936/37 but two years later with her marriage to Count Reventlow ending and war looming, she closed the house and returned to America. She was to marry Cary Grant in 1942. During World War II Winfield House was put to utilitarian use by the Air Ministry and a balloon barrage unit was located there for a time. On December 1, 1945 Hutton wrote to President Harry S Truman offering Winfield House to the American government and it was accepted as a home for the American ambassador to Britain. When Walter Annenberg was appointed in 1969, he and wife funded an extensive renovation and redecoration. Other ambassadors have made their own contributions. 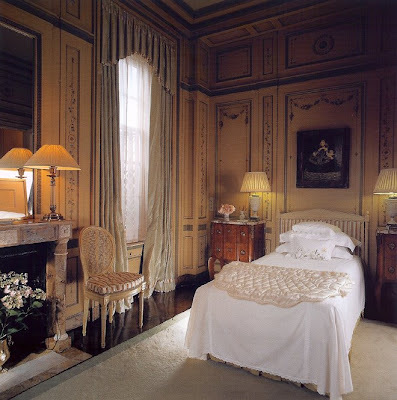 This was the Tuttle's private room and Maria was always generous in opening it and other principal bedrooms for her guests to see. You would go upstairs and if the doors were open you could peep inside. 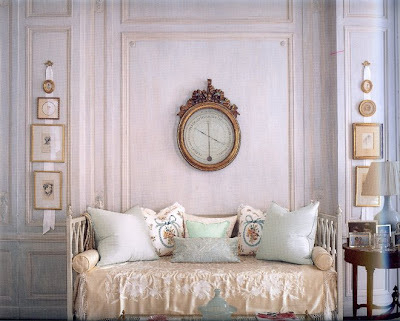 I fell in love with the ice blue chaise longue. Below is another view. 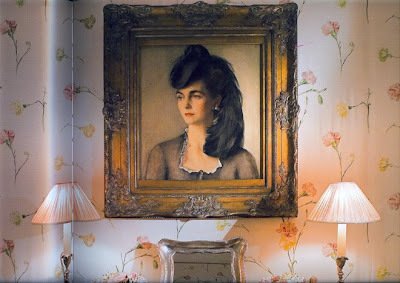 The Ambassador's wife's study(and below). 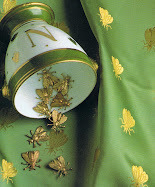 Each brings her personal elements to the decoration of the room. The house as it is today. The gardens are gorgeous and provide all the flowers and vegetables for its busy schedule of entertaining. Fabulous Post! Have you been there? couldn't wait to visit this post - and it surpassed all expectations. Those drawer liners???? will return soon to savor at length - thanks, Rose! Thank you Olivia. I have indeed been there to receptions and dinner. The Fourth of July garden party is always sensational and guests are welcome to tour the house at their leisure. Thank you Emily. 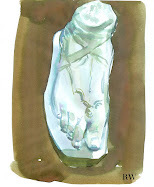 I really appreciate your footprint on my blog! I very much enjoyed looking at this, and will keep my eye on your blogging from now on! Yuurrgh what a ghastly hotchpotch of mostly dreadful unrelaxing uncomfortable furnishings. What is it about our government buildings that they have to be so, so, bllllerch, chintzy but not in a good way. Can't imagine the walk-on-water Obamas found it a calm welcoming place to be in. Good location though. Glad you found Winfield House a useful emetic Catherine! 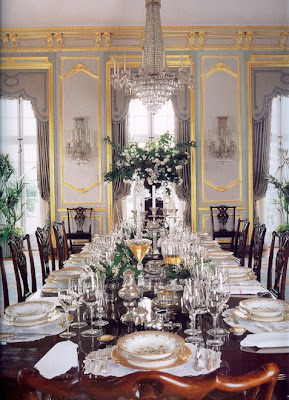 I'd like to be cool and agree with you but I confess I find the house exquisite. Isn't it calculated to make you feel grown up, not cosy, visiting? 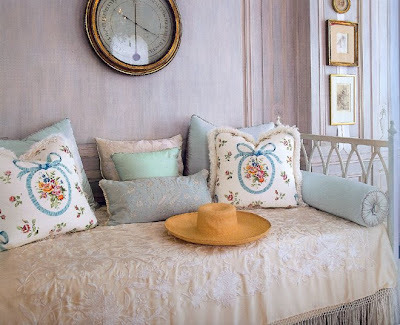 Having said that, I do have a juvenile urge to jump on Maria Tuttle's bed and throw those pillows around. 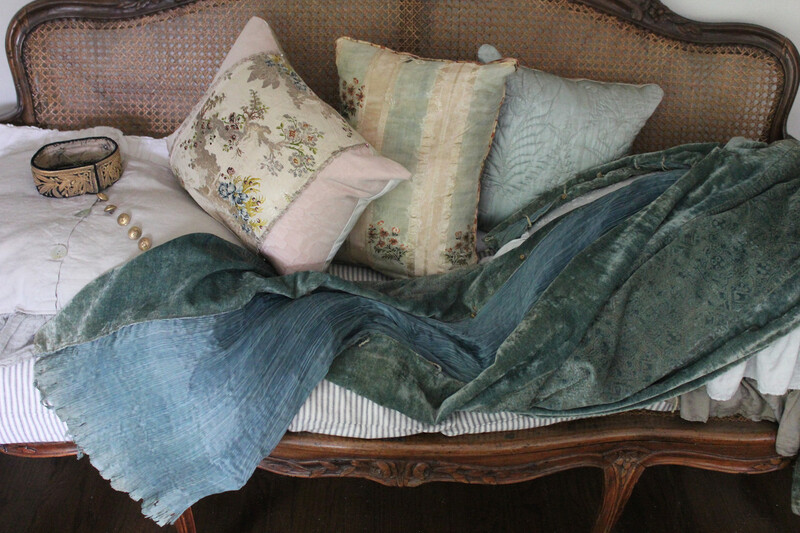 Banks of pillows are extremely vexatious in my book. Great that somebody feels free to demur. Don't stop. Hi Louisa! thanks for visiting R C La Vie. I' ve been reading your blog for a while but this post was so good that I had to say so. Somehow, I didn't even know about this book, so thanks for letting us know. I'm especially happy to see Sorine's portrait of Hutton, which I've been looking for for a while, but had never found. Magnaverde, I'm flattered by your interest. Thank you. What a stroke of luck about Sorine's portrait of Hutton! What a Home? Barbara Hutton was INCREDIBLE. Queen!! I understand the Bathrooms were outfittered with 24 carat gold taps. Michael, thank you for finding this! The house was in a mess when Barbara gave it to the American nation because it had been used for the military in the war. It is thanks to successive American ambassadors that it has been restored to this glorious state. Barbara had many homes prior to her death @ The Beverly Wilshire Regant in Beverly Hills in 1979, sadly the only one still in her name upon her death was her beloved Sidi Honsi in the Cabah of Marakesh, Morroco, she was one of the first celebrities to settle thier and through lavish parties on her rooftop overlooking the Medina, It's said that she outbid General Franco for it. She has left a Beautiful home a Japanese mansion with gardens and Kabiki theatre in Cuernavaca Mexico, it's a replica of a house in Japan and was completed after 3 years of construction in 1963 and served as her place of marriage for the 7th time to Prince Doan of Vietnam. She left it to the Mexican Government and it has been kepr beautifuly. You can dine there today it's called "Sumiya'. 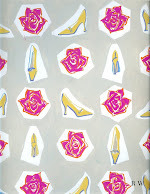 The Doris Duke Auction: My Bidding List! Google Street View - Love It Or Hate It? Little Miss Head in Air?